We really enjoyed the anchorage at Los Candeleros but it was time to move on. We’d been there for four days and now the winds had moved around to come from the north. Not real wind mind you, but that anchorage is wide open to any wind, however modest, from the NW through NE and the fetch/breeze combination was creating enough wave action that our comfort threshold was being threatened. Time to move on. There was also a possibility of a real weather system of arriving in our neighborhood in the next week so we chose the “hurricane hole” that is Puerto Escondido. 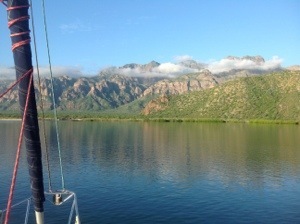 About 17 miles South of Loreto, Pto. 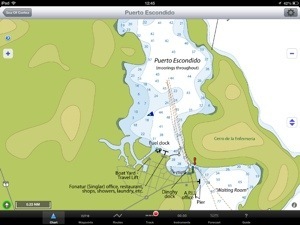 Escondido is a large harbor populated with permanent mooring balls as well as a lot of wide open anchoring space. There are services here too, a very well stocked mini market, a restaurant, fuel and laundry. Because of the protected nature of the location and these services Pto. Escondido is a popular location for cruisers, especially when weather threatens. You can find us anchored at 25 49.130N, 111 18.801W. We’ve connected with a number of friends here and a few more arrive each day what with tropical storm Octave approaching. We’ve kept a close eye on this weather and the prognoses as of this morning is that we will see some rain over the next several days but not enough wind to cause any real concern. That forecast is encouraging but, it ain’t over ’til it’s over so we will sit tight and re-evaluate each day. There are still so many places to visit that we’d like to move on sooner rather than later, as soon as conditions allow us to do so with confidence. After almost continuous sunshine it was odd to wake in the middle of the night to the sound of rain on the deck. Quick, get the hatches closed and bring in the laundry hanging on the lifelines. It was a light rain that has continued off and on since and nothing got wet that shouldn’t have. The weather weenies say we should get real rain tonight and tomorrow. 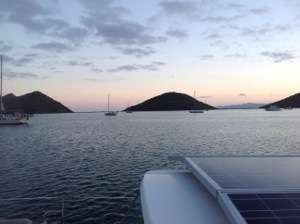 With no real wind or useful sunshine the wind turbine and solar panels won’t be able to perform their usual magic so we will have to break out the old Honda generator to make electricity under these conditions. And that is exactly why we drag it around. Yesterday (Saturday) Judy did laundry while I took the last seat available in another cruisers car headed to Loreto. By the end of the day the laundry was all done and we had grocery items that the mini market doesn’t stock. Nice! Today the restaurant (Pedro’s Portobella Restaurant) is hosting American football with drink and menu specials. Pizza by the slice (his pizza is awesome by any standard! ), hamburgesas, and polish sausage dogs. They open between 1230 and 1300 (or maybe 1330, it’s Mexico) and I suppose it will be packed with cruisers shortly after. So, for a few days anyway, swimming and snorkeling have been replaced by eating out and cable TV. And incredible sunrises and sunsets by overcast skies and rain. But the water is glassy calm, the Kahlua coffee is hot and the Sierra Gigante mountains overlooking the harbor are lush green with cloud enshrouded shoulders – sort of South Pacific like. Or, at least, how I imagine the South Pacific islands look, which is close enough. It is a different kind of paradise than the past few weeks but who is going to complain?